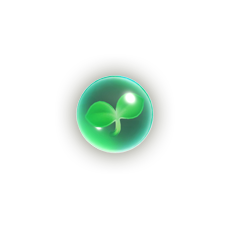 The Healing Sprout (やすらぎのたま, Tama of peacefulness) is an item in Super Smash Bros. Ultimate. Isabelle getting healed by holding the Healing Sprout. The Healing Sprout is a throwing item that sticks to fighters and gradually heals them. It can be transferred from fighter to fighter on contact, similarly to the Gooey Bomb. The sprout will heal whoever picks it up when the item is held. This will prevent the sprout from transferring, as long as it is not thrown. 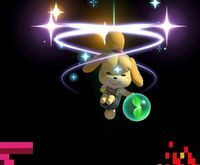 Players can stick the sprout onto themselves by throwing it up and touching it while it comes down, which will allow them to use any attack while being healed, but the sprout will be susceptible to being transferred. This page was last edited on March 3, 2019, at 13:32.